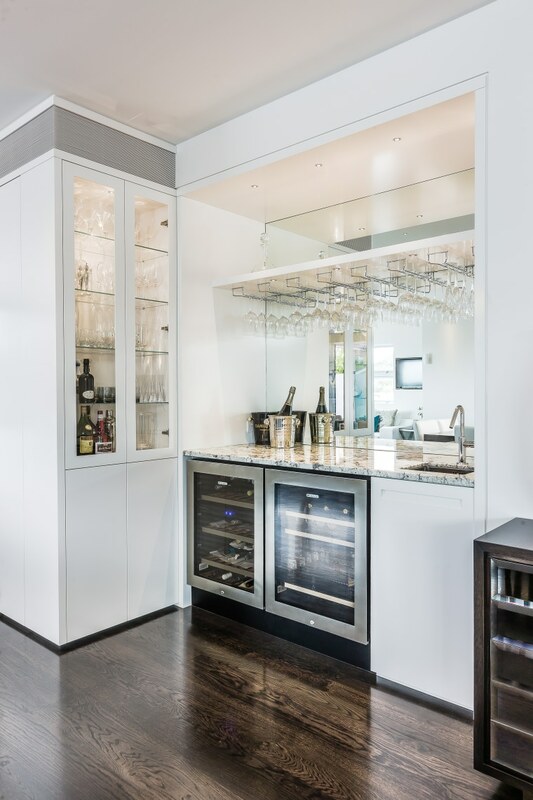 Glass display cabinets with interior lighting enliven the bar area in this kitchen by Fyfe Kitchens. 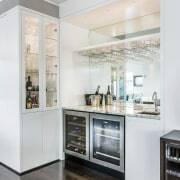 The bar also features wine refrigerators, a full-height mirrored splashback and a railing system to store wine glasses. A passion for great cuisine can spark a similarly innovative kitchen design response, as this project shows. 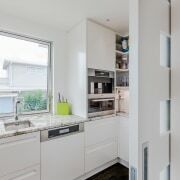 Designer Kira Gray of Fyfe Kitchens says the owners wanted a futuristic kitchen that would complement their modern, high-tech home and cater to their love of entertaining. "They required three defined areas that would cater to specific purposes the main kitchen, a scullery and a bar area." Hidden behind a sliding door, the scullery in this kitchen has a coffee machine, microwave and dishwasher. The kitchen is by Fyfe Kitchens. 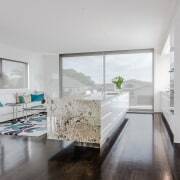 Kira Gray positioned the kitchen close to the front balcony, with the cooking area beneath a window to maximise views to Rangitoto Island. 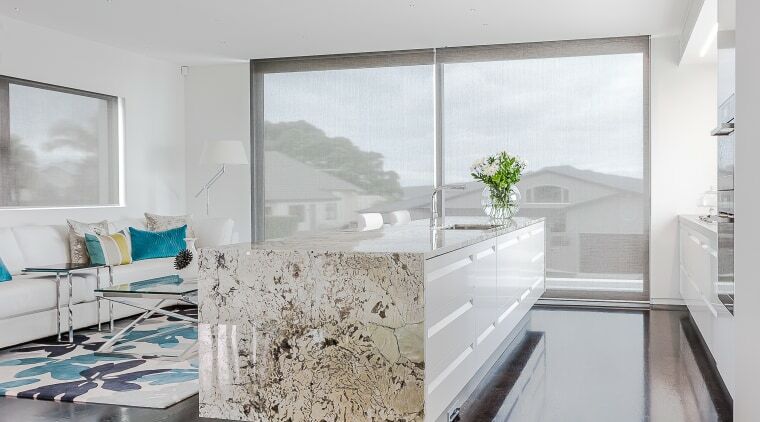 This work area has a neutral stainless steel benchtop, which lets the waterfall granite benchtop on the cantilevered island be the hero. The highly textural granite, from Stone Warehouse, also features in the adjacent bar area. Satin-lacquered cabinets are teamed with timber veneer. This helps to warm the kitchen visually. 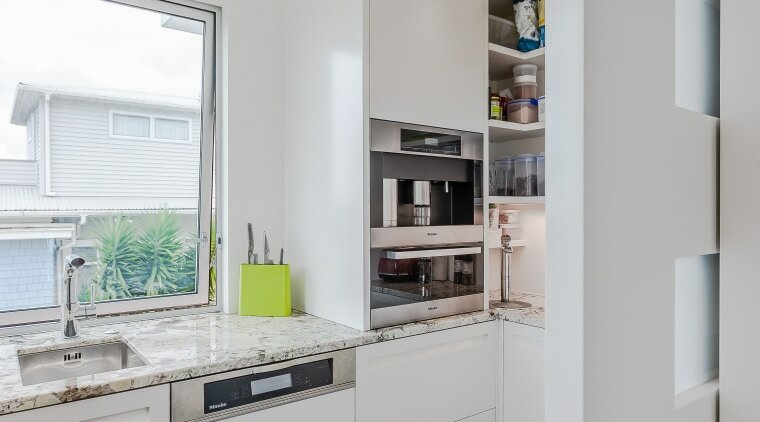 But the high-tech look is not compromised a deep stainless steel toekick and negative detailing enhance the sleek, floating look of the island. A textural granite benchtop with waterfall ends wraps the long island in this new galley-style kitchen designed by Kira Gray and manufactured by Fyfe Kitchens. The Arctic Cream granite is from Stone Warehouse.